An artist's impression of the Dawn spacecraft in orbit around Vesta. A NASA spacecraft is getting its best look yet at the asteroid Vesta as it zooms closer than ever to the giant space rock's surface. At 330 miles (530 kilometers) wide, Vesta is the second most massive object in the asteroid belt between Mars and Jupiter. The huge rock is considered a protoplanet that could have developed into a full-fledged planet like Earth or Mars, if the nearby Jupiter hadn't stripped too much material away in the early days of the solar system. NASA's Dawn spacecraft is in the middle of a yearlong campaign to study Vesta and the dwarf planet Ceres to learn more about our solar system's history using these leftover pieces of its formation. 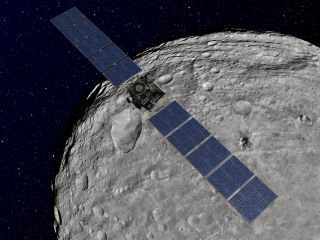 "Dawn has performed some complicated and beautiful choreography in order to reach this lowest orbit," Marc Rayman, Dawn chief engineer and mission manager based at NASA's Jet Propulsion Laboratory in Pasadena, Calif., said in a statement. "We are in an excellent position to learn much more about the secrets of Vesta's surface and interior." This image of the giant asteroid Vesta was obtained by NASA's Dawn spacecraft in the evening Nov. 27 PST (early morning Nov. 28, UTC), as it was spiraling down from its high altitude mapping orbit to low altitude mapping orbit. Low altitude mapping orbit is the closest orbit Dawn will be making, at an average of 130 miles (210 kilometers) above the giant asteroid's surface. Vesta is so huge that a mountain rising from its south pole is nearly three times as high as Mount Everest, Earth's tallest peak. "Dawn's visit to Vesta has been eye-opening so far, showing us troughs and peaks that telescopes only hinted at," said Dawn's principal investigator Christopher Russell of UCLA. "It whets the appetite for a day when human explorers can see the wonders of asteroids for themselves." NASA is in fact planning to send astronauts to visit an asteroid by the year 2025. Missions like Dawn provide a vital opportunity to preview the scene that people will one day encounter, space agency officials said. The $466 million Dawn spacecraft launched in 2007 and has been orbiting Vesta since July 15. The spacecraft will stay in its low-altitude mapping orbit for at least 10 weeks. After that, the probe will spiral back to its high-altitude mapping orbit at about 420 miles (680 km) in altitude. In July 2012, the spacecraft will depart Vesta for its second target, with an expected arrival date at Ceres in February 2015. Ceres is the largest space rock in the solar system's asteroid belt.